Heterogeneous Vesicles with Phases having Different Preferred Curvatures: Shape Fluctuations and Mechanics of Active Deformations, D.A. Rower, P.J. Atzberger, (submitted), (2019) [preprint] [arXiv]. Topological Methods for Polymeric Materials: Characterizing the Relationship Between Polymer Entanglement and Viscoelasticity, E. Panagiotou, K. Millett, and P. J. Atzberger, Polymers, 11(3), 437 (2019) [preprint] [arXiv] [full paper]. Stochastic Discontinuous Galerkin Methods (SDGM) Based on Fluctuation-Dissipation Balance, W. Pazner, N. Trask, P.J. Atzberger, (submitted), (2018) [preprint] [arXiv]. Importance of the Mathematical Foundations of Machine Learning Methods for Scientific and Engineering Applications, P. J. Atzberger, Position paper accepted for presentation at SciML2018 Workshop, (two-page limit), US Department of Energy, January, (2018) [paper] [arXiv]. 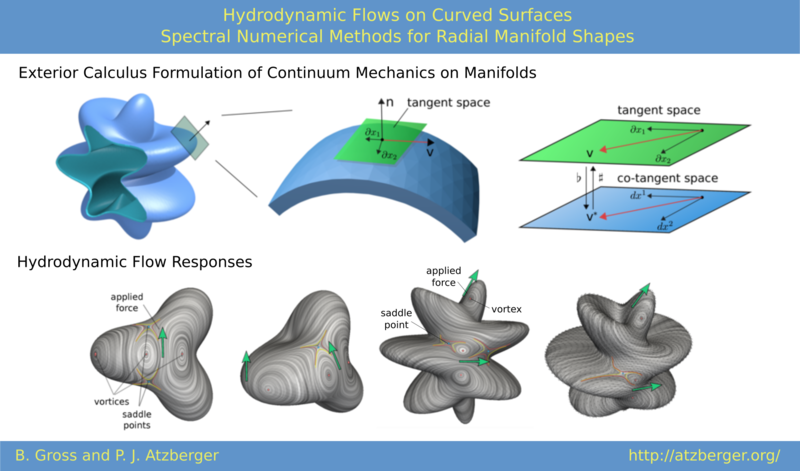 Hydrodynamic Flows on Curved Surfaces: Spectral Numerical Methods for Radial Manifold Shapes, B. Gross and P.J. Atzberger, Journal of Computational Physics, Volume 371, pp 663-689, (2018) [preprint] [arXiv] [full paper] [graphical abstract]. Spectral Numerical Exterior Calculus Methods for Differential Equations on Radial Manifolds, B. Gross and P.J. Atzberger, Journal of Scientific Computing, 76, pp 145�165, (2018) [preprint] [arXiv] [open share] [full paper]. Electrostatics of Colloidal Particles Confined in Nanochannels: Role of Double-Layer Interactions and Ion-Ion Correlations, I.S. Sidhu , A.L. Frischknecht, P.J. Atzberger, ACS Omega 3 (9), 11340-11353, (2018) [preprint] [arXiv] [full paper]. Fluctuating Hydrodynamic Methods for Fluid-Structure Interactions in Confined Channel Geometries, Y. Wang, H. Lei, P. Atzberger, Applied Mathematics and Mechanics (Springer), January, Volume 39, Issue 1, pp 125�152, (2018) [preprint] [full paper]. General Bayesian Inference over the Stiefel Manifold via the Givens Transform, A. A. Pourzanjani, R. M. Jiang, B. Mitchell, P. J. Atzberger, L. R. Petzold, (submitted), (2017) [preprint], [arXiv]. Förster Resonance Energy Transfer: Role of Diffusion of Fluorophore Orientation and Separation in Observed Shifts of FRET Efficiency, B. Wallace, P.J. Atzberger, PLoS ONE 12(5): e0177122, (2017) [preprint] [full paper]. Hydrodynamic Coupling of Particle Inclusions Embedded in Curved Lipid Bilayer Membranes, [featured on journal cover], J.K. Sigurdsson and P.J. Atzberger, 12, 6685-6707, Soft Matter, The Royal Society of Chemistry, (2016) [preprint] [full paper] [cover of journal]. Fluctuating Hydrodynamics Methods for Dynamic Coarse-Grained Implicit-Solvent Simulations in LAMMPS, Y. Wang, J. K. Sigurdsson, and P.J. Atzberger, SIAM J. Sci. Comput. , 38(5), S62�S77, (2016) [preprint] [full paper] [software]. Stochastic Reductions for Inertial Fluid-Structure Interactions Subject to Thermal Fluctuations, G. Tabak and P.J. Atzberger, SIAM J. Appl. Math., 75(4), 1884�1914, (2015) [preprint] [arXiv] [full paper]. Simulation of Osmotic Swelling by the Stochastic Immersed Boundary Method, C.H. Wu, T.G. Fai, P.J. Atzberger, and C.S. Peskin, SIAM J. Sci. Comput., 37, (2015). [preprint] [full paper]. Spatially Adaptive Stochastic Methods for Fluid-Structure Interactions Subject to Thermal Fluctuations in Domains with Complex Geometries,P. Plunkett, J. Hu, C. Siefert, P.J. Atzberger, Journal of Computational Physics, Vol. 277, 15 Nov. 2014, pg. 121--137, (2014) [preprint] [arXiv] [full paper]. Shape matters in protein mobility within membranes, F. Quemeneur, J.K. Sigurdsson, M. Renner, P.J. Atzberger, P. Bassereau, and D. Lacoste, Proceedings of the National Academy of Sciences (PNAS), Vol. 11, No. 14, pg. 5083�5087, (2014), [PDF] [full paper]. Fluctuating Hydrodynamic Methods for Fluid-Structure Interactions in Confined Channel Geometries, Y. Wang, P. Atzberger, (technical report), [preprint]. Simulation of Edge Facilitated Adsorption and Critical Concentration Induced Rupture of Vesicles at a Surface [featured on journal cover], P. Plunkett, B. Camley, K. Weirich, J. Israelachvili, P. Atzberger, 9, 8420-8427, Soft Matter, The Royal Society of Chemistry, (2013), [preprint] [movie] [cover of journal] [full paper]. [course notes and related materials]. * My Erdos Number = 3. *This material is based upon work supported by the National Science Foundation under Grant No. NSF DMS-0635535 and NSF CAREER DMS-0956210. Any opinions, findings and conclusions or recomendations expressed in this material are those of the author(s) and do not necessarily reflect the views of the National Science Foundation (NSF).